Our MIT Engineering Health class is about Designing and Deploying Affordable Health Diagnostics and Therapeutics. 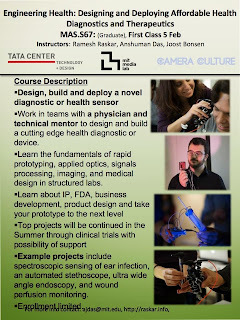 Design and build novel health diagnostics and sensors while learning the fundamentals of rapid prototyping, applied optics, signals processing, imaging and other advanced sensing modalities. Students work in teams with a physician and technical mentor to design and construct a cutting edge health diagnostic or device. The best projects will be continued in the summer through a clinical trials and ventures program with the best projects reaching early trials by the end of the school year. Example projects include spectroscopic sensing of ear infection, an automated stethoscope, non-contact blood pressure sensors, ultra wide angle endoscopy, and wound perfusion monitoring. Structured labs will build engineering and design skills, lectures will introduce considerations for medical design and new prototyping techniques. First class is Thursday night 7-9p on February 5th, 2015 in Media Lab E15-341.